As part of the therapeutic concept, the dentist must differentiate between a surgical and a non- surgical approach with synergistic therapy plans an option depending on the case. As well as pharmacotherapy and manual therapy forms (Teflon, carbon, plastic and titanium curettes, ultrasound and air-powder abrasive systems), innovative techniques such as laser-supported and photodynamic therapy can be used. In this regard, therapy using ultrasound or curettage deliver consistently worse results than treatments using air-power abrasive systems (SCHWARZ et al., 2008, TASTEPE et al., 2013; TASTEPE et al., 2012; PERSSON et al., 2010; RENVERT et al., 2009; SAHM et al., 2011; LOUROPOULOU et al., 2013; KARRING et al., 2005; Smeets et al., 2014a). PERSSON et al. (2010) and RENVERT et al. 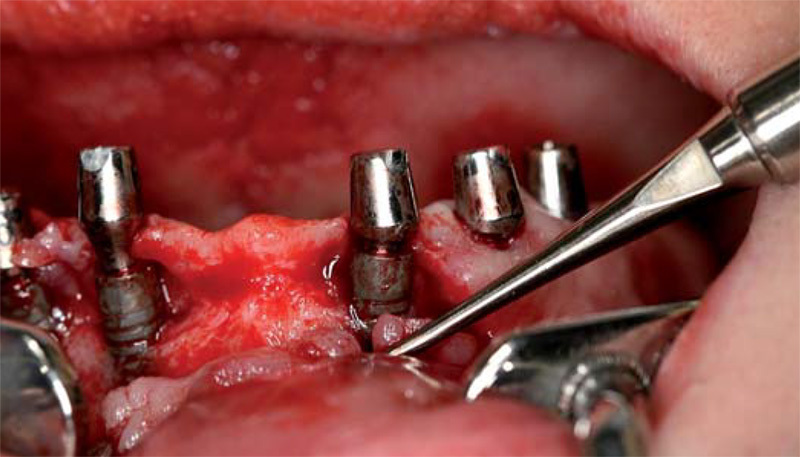 (2009) recorded significantly lower bacteria counts in some cases with a partial reduction in the plaque and bleeding scores after mechanical curettage, while SCHWARZ et al. (2008) reported 30% fewer residual biofilm areas with ultrasound treatments. Depending on the surface topography, different therapy approaches can be pursued. (Tab. 4). Qualitatively determined effectiveness (x: yes/o: no) of various debridement methods depending on the titanium surface (LOUROPOULOU et al., 2013; Smeets 2014a). The treatment outcome for air-powder abrasive systems, which are classified overall as effective, is dependent on the powder used with significantly better results achieved in the order hydroxyapatite / tricalcium phosphate, hydroxyapatite, glycine powder > titanium dioxide > water and air (control group) > phosphoric acid (TASTEPE et al., 2013). Abrasive powders can modify the surface of implants and form residues, while the cellular adhesion behaviour with lower cell response is preserved (TASTEPE et al., 2012, SAHM et al., 2011). The rate of re-osseointegration of titanium implants after air-powder abrasion is given as between 39% and 46% with an increase in the clinical implant attachment and a reduction in the pocket depth (TASTEPE et al., 2012). The occurrence of bleeding, one of the qualitative parameters for the presence of peri-implantitis, is not reduced (SAHM et al., 2011). Smoothing of all surface roughness and removal of the infected surface bone layers using an Er:YAG laser. Fig. 4 Surface shaping on the implant. In a review by JAVED et al. (2013) that referred to nine studies, systemic and local application of antibiotics (e.g. tetracycline, doxycycline, amoxicillin, metronidazole, minocycline hydrochloride, ciprofloxacin, sulfonamides + trimethoprim) led to significant reductions in the probing pocket depths over a period of between one and six years. The same phenomenon was observed by MOURA et al. (2012) for resorbable nanospheres that release doxycycline applied locally over a period of 15 months. LEONHARDT et al. (2003) reported an overall success rate of 58% for various systemic antibiotics and combinations of antibiotics after surgical exposure and debridement of the implant surfaces. ASTASOV-FRAUENHOFFER and colleagues (2013) detected complete growth inhibiting effects for the 10× MICs (minimum inhibitory concentrations) of amoxicillin and metronidazole onS. sanguinis and P. gingivalis with no combinations of active substances being able to achieve better results. BASSETTI et al. (2013) were not able to identify any differences in terms of the reduction in the probing pocket depths or reductions in the bacterial count in the dental pockets in a comparison of local administration of antibiotics and photodynamic therapy. Grapefruit juice, which is a known antioxidant, only acted bacteriostatically against S. aureus (SHRESTHA et al., 2012). Rinses and applications of chlorhexidine led to a reduction in the probing pocket depths, greater implant adhesion and a general lessening of the inflammation for the inflammation parameters IL-1 beta, VEGF and PGE-2 in various studies (MACHTHEI et al., 2012; WAAL et al., 2013; DI CARLO et al., 2008). Compared to doxycycline, chlorhexidine led to significantly smaller reductions in the probing pocket depths (RENVERT et al., 2008; RENVERT et al., 2006). With tissue engineering, LAN et al. (2013) demonstrated continuous release kinetics for metronidazole over 30 days using poly-ε-caprolactone/alginate rings. HOU et al. (2011) incorporated fluorouracil into cylindrical poly-ε-caprolactone implants of various diameters. With the advantage of having a bactericidal mode of action, CO2, diode, Er:YAG (erbium-doped yttrium aluminium garnet) and Er,Cr:YAG (erbium, chromiumdoped yttrium aluminium garnet) lasers are increasingly used to treat peri-implantitis but absorption and reflections must be minimised to protect materials and tissue. Er:YAG and Er,Cr:YAG wavelengths in a spectrum of 3 μm can reduce biofilms by up to 90% although possible biocompatibility and cell stimulating properties can be compromised, unlike most mechanical therapy approaches (SCHWARZ et al., 2008, YAMAMOTO & TANABE, 2013; SCHWARZ et al., 2006). Irradiation with a CO2 308 nm excimer laser produced satisfactorily effective results, mostly in the anaerobic bacterial spectrum (DEPPE et al., 2007). 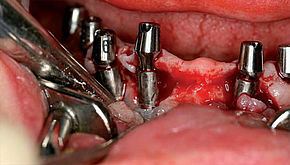 Compared to mechanical treatment using plastic curettes, treatments with an Er:YAG laser produced significantly better results for the bleeding incidents with peri-implantitis, although probing pocket depths, clinical attachment level, plaque index and gingival recession did not differ significantly from one another for the two types of therapy but did improve compared to the baseline values (SCHWARZ et al., 2006) (Fig. 4). PERSSON et al. (2011) investigated the effectiveness of Er:YAG lasers compared to a air-powder abrasive system in a randomised clinical trial with 42 patients over 6 months. Apart from a difference in the reductions of specific bacteria after one month (Er:YAG: Fusobacterium nucleatum; air-powder abrasive system: P. aeruginosa, S. aureus and S. anaerobius), after 6 months no long-term reductions were observed. Reactive oxygen species are generated by multiplicity using high-energy single-frequency light, e.g. from diode lasers, combined with photosensitisers (e.g. toluidine blue). In a wavelength range of 580 to 1400 nm and toluidine concentrations between 10 and 50 μg/mL, photodynamic therapy developed bactericidal effects against aerobic and anaerobic bacteria (A. actinomycetemcomitans, P. gingivalis, P. intermedia, S. mutans, E. faecalis) (SCHWARZ et al., 2008; AL-AHMAD et al., 2013; MEISEL & KOCHER, 2005). In a study by DEPPE et al. (2013) on the effectiveness of phototherapy in the treatment of moderate to severe peri-implantitis, both the clinical attachment loss and the bleeding index were significantly reduced although more severe courses continued to exhibit bone resorption. For this reason, photodynamic therapy approaches should only be used for less advanced stages. Taking into account the non-surgical therapy approaches discussed above, the treatment of mucositis as part of a general improvement in oral hygiene is divided into mechanical implant de- bridement (titanium and plastic curettes, ultra- sound, air-powder abrasive systems, photodynamic therapy), oral (chlorhexidine gluconate, fluoride, hydrogen peroxide, sodium percarbonate) and local (e.g. povidone-iodone) antiseptic measures. In two randomised clinical trials (HEITZ-MAYFIELD et al., 2011, HALLSTRÖM et al., 2012), anti-infective measures (chlorhexidine and Azithromax® (macrolide)) did not show any advantages compared to the relevant control group for the reduction of probing pocket depths, plaque index or suppuration. Reductions in the bleeding index were attributed to the general improvement in oral hygiene with reference to the potential importance of guidelines or treatment protocols (HEITZ-MAYFIELD et al., 2011; HALLSTRÖM et al., 2012; ZEZA & PILLONI et al., 2012). Surgical therapy combines the non-surgical forms of therapy discussed above with resective and regenerative surgical approaches. The indication for therapy and the surgical approach itself have been demonstrated in patient trials (Tab. 5, 6) and among other items were assessed using the Cumulative Interceptive Supportive Therapy (CIST) concept (RUTAR et al., 2001; SCHMAGE, 2010; Smeets et al., 2014a). According to the entire body of trial data, autologous, allogeneic and xenogeneic biomaterials are often used as augmentation materials for bone defects in terms of jaw surgery augmentation approaches, with allogeneic and xenogeneic transplants found to be almost equivalent to autologous material (FISCHER et al., 2011; KOLK et al., 2012; SMEETS & KOLK, 2011; Smeets et al., 2014b,c,d). In a retrospective study by LAGERVALL et al. 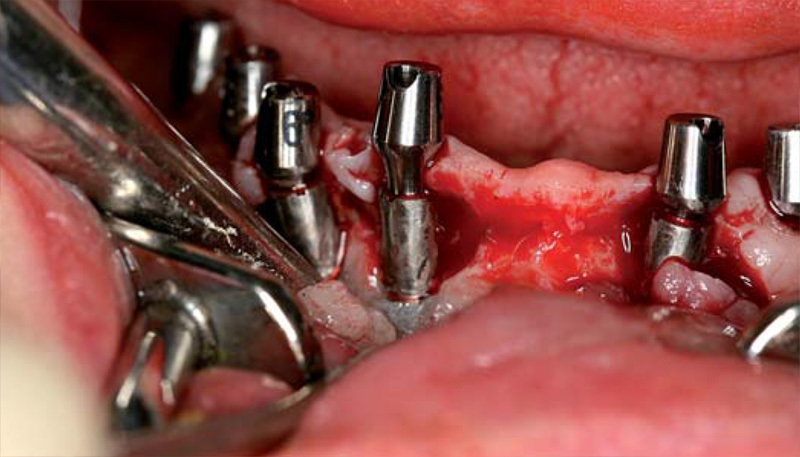 (2013) with 150 patients (382 implants), the type of operation most used was periodontal flap surgery with osteoplasty (47%) followed by the use of bone substitutes (20%). For both procedures a cumulative success rate of 69% was recorded which was significantly lower for patients with risk factors such as smoking, periodontitis and poor oral hygiene.